In 354 Augustine was born in Tagaste, part of northern Africa, which is today known as Algeria. His father, Patricius, was a Roman official. He owned land that he farmed. Patricius married Monica and they had three children. 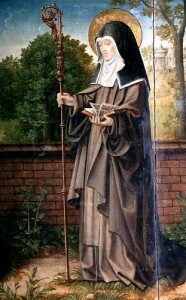 Monica was a Christian and also became a saint, but her husband was a pagan. 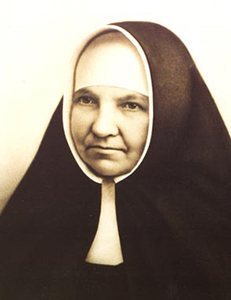 She prayed often that her family would be Christians. Just before he died in 371, Patricius converted to Christianity. Augustine would not convert for many more years. 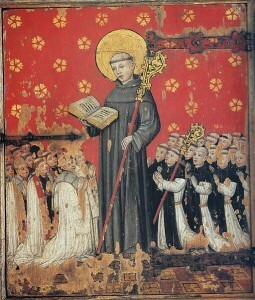 Augustine didn’t like school and spent much of his time playing with his friends. His teachers would often punish him for not knowing the correct answers. Finally, he discovered that he loved the Latin language. He worked very hard to study Latin and showed everyone he was actually very intelligent. Patricius wanted his son to be a teacher and have a good job with the Roman government. Augustine tried this, but really wanted to teach in Milan, Italy. In Milan, he thought, the students wanted to learn, and they respected their teachers and education. While Augustine was in Milan, he met Bishop Ambrose. 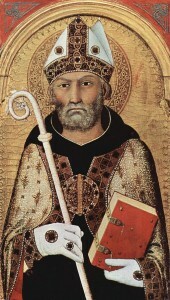 Augustine liked the way Ambrose explained things and because of this, Augustine decided to become a Catholic. For more than 30 years after his conversion in 387, Augustine said and wrote many important things that helped people understand God and how they could have a personal relationship with God. He became a priest and a bishop in northern Africa, where he died in 430. Today we still find Augustine’s explanation of the Trinity helpful. He wrote a famous book called City of God that showed people the difference between living on Earth and living with God in Heaven. He also wrote a book called Confessions that many people still read today. Augustine helped people see that God is very patient with us and loves us. God wants us to be in Heaven with him forever. St. Augustine of Hippo is a Doctor of the Church. He is the patron saint of printers and brewers as well as theologians.